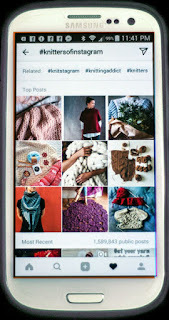 Instagram is full of KNITTING!! A few years ago, a dear but distant friend of mine (we'll call her B) stopped using Facebook. This made me sad. I love Facebook because it keeps me in touch with friends like B. It keeps them an active part of my life, even when they're far away. With all its well-documented flaws, Facebook is great for that (it's great for other things, too, and I am strongly pro-Facebook, but that's another post). When she stopped using Facebook, B told me she was using Instagram and loving it. That sounded interesting, so I created an account, uploaded a profile pic, and started looking around. But I just didn't understand. You couldn't upload from a computer! You had to upload from a phone! 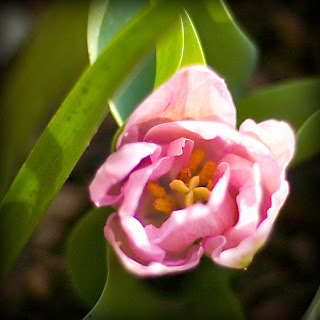 I love taking photos, but I use a camera, not a phone, and I use Photoshop to process my photos. 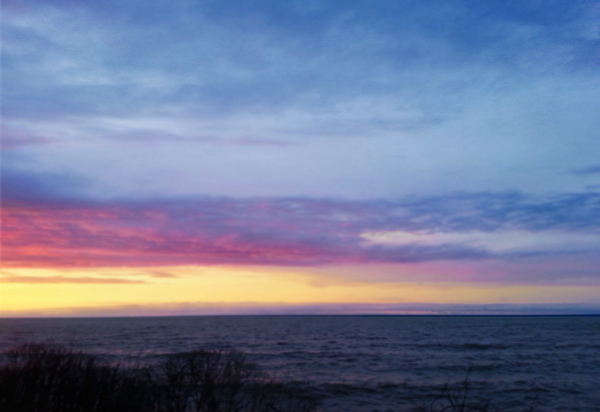 The unprocessed images from my low-IQ pseudo-smartphone weren't anything I wanted to share. How were those IG people posting such gorgeous pictures? How was one supposed to get the photos from the good camera to the desktop to the phone? I found some apps that would do the job, but it all seemed so complicated. And I didn't get the whole Instagram thing. I'd been photosharing on Flickr for years, and Flickr was quietly dying (well, Yahoo was killing it, but the end result was the same). How was Instagram different? I still didn't get the IG thing, but I started posting occasionally. I followed people I knew, and then some people I didn't know, and then more and more of the people related to the people I was already following (and I hardly knew who any of them really were because most of them have different usernames on different platforms and the profile pics are tiny and I can't keep them straight, but I've started keeping a cheat sheet so that's getting better)...and all of a sudden I found myself immersed in Instagram World. 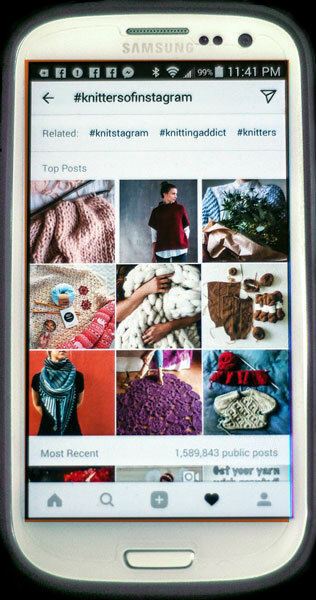 Specifically, Knitting Instagram World. And what a world it is! 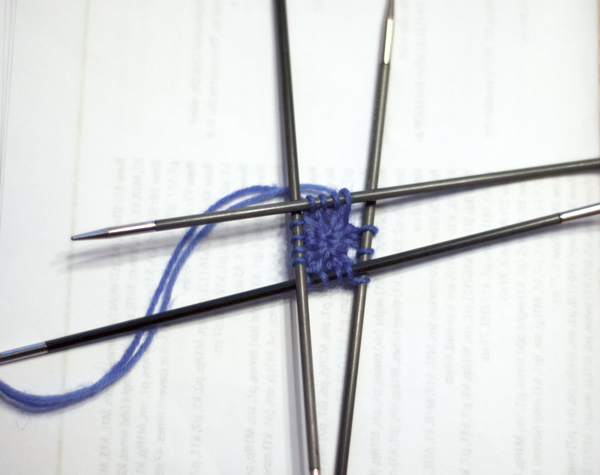 I thought Ravelry was the only way to interact with Knitting World. Now I get it. Instagram and I are going to be very happy together. Thank you, B! Except, of course, I'm about five years late to the party and no doubt the platform is about to fade into obscurity to be replaced by some hot new thing that I won't hear about for another three years. But that's okay. Knitting will endure. 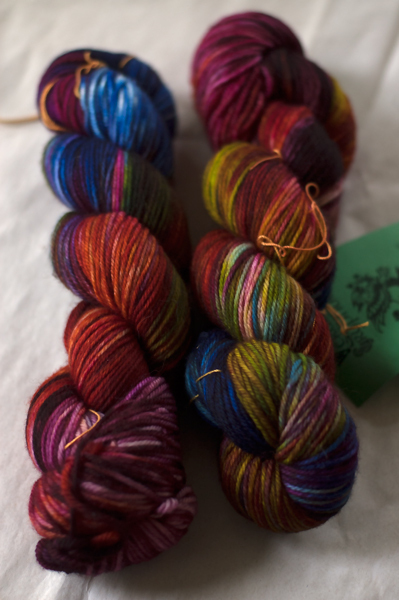 I broke my nearly four-month-long yarn fast for these beauties. 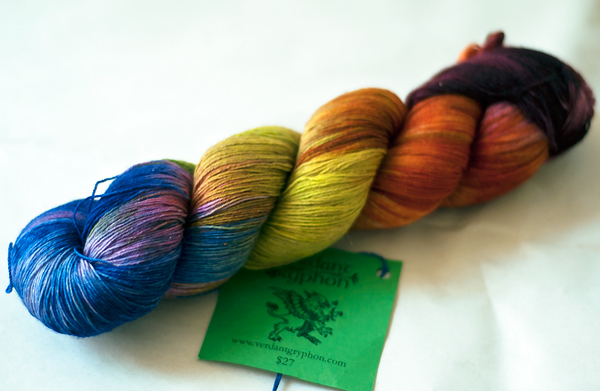 The yarn is Mithril from the Verdant Gryphon. It's a lovely laceweight merino, plied tightly enough to have some body but not so tightly that it loses its softness. One of my favorite yarns. 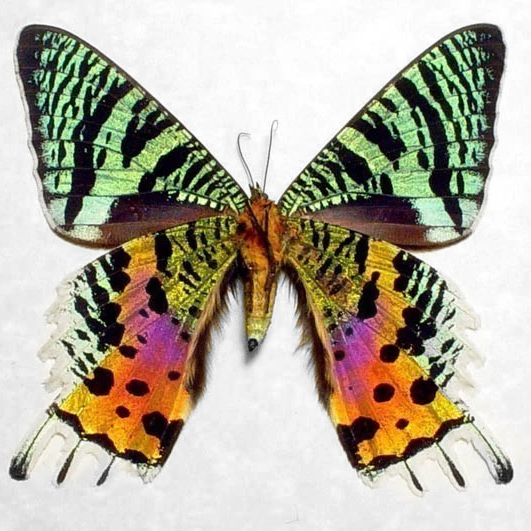 The color is Madagascan Sunset Moth. I already had one skein of it in my stash, so when I saw these skeins pop up at a discount, I grabbed them. Well, no, that's not true. 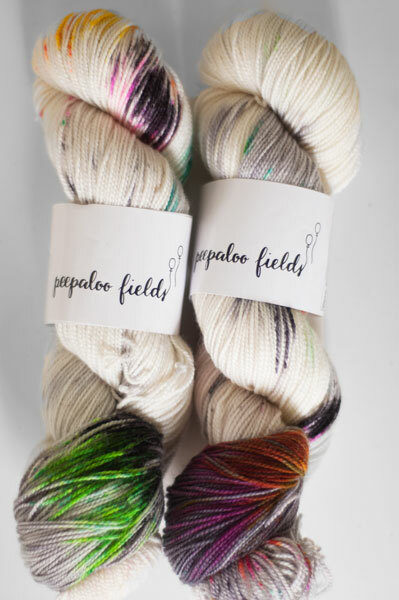 I didn't want to break my streak of not-buying yarn, so I thought about it for over a week before finally deciding to buy....at which point there were only two skeins remaining of the original three. So I guess I only needed two. This is my existing skein of the same color in the same base. Looks a little different, doesn't it? 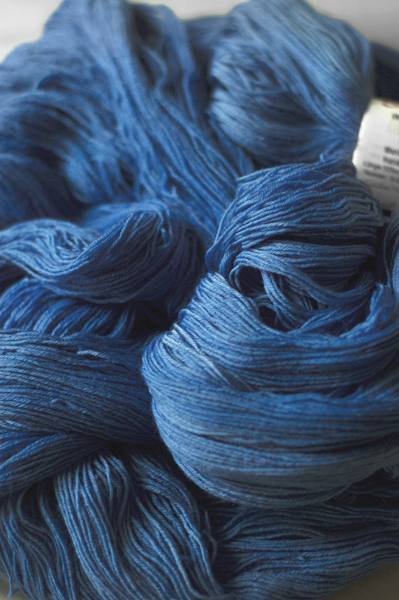 It isn't unusual for hand-dyed yarns to vary from batch to batch, but this is a big difference. It probably reflects the change in ownership and management at the Verdant Gryphon. I don't mind, really; I'll just treat them as two different colors. They're all gorgeous. I also have Madagascan Sunset Moth from VG on Traveller, a DK weight base. Looks like a cross between the the first two. 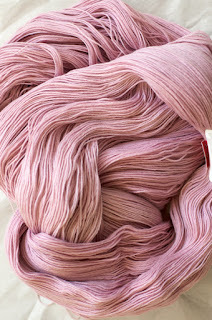 I'd like to use this in a textured stitch pattern for the yoke on a solid color (maybe gray?) 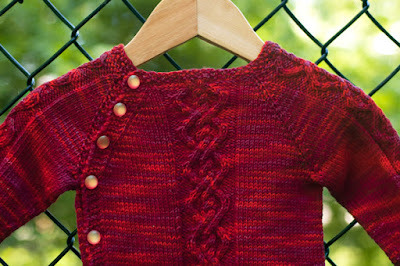 stockinette stitch cardigan. I just have to choose the solid color, buy it, design the sweater, and knit it. I'm sure I'll get to it one of these days. 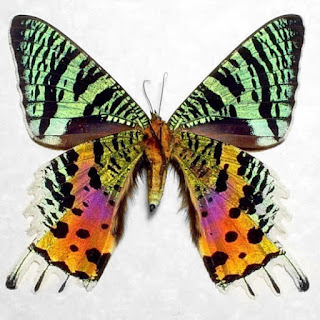 Here's a real Madagascan Sunset Moth, in case you were wondering. 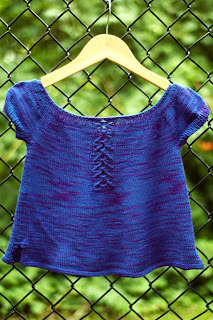 This is the last thing I finished before my Summer of Not Knitting: a sweet little top for my small friend Cecilia, who loves wearing handknits made especially for her. 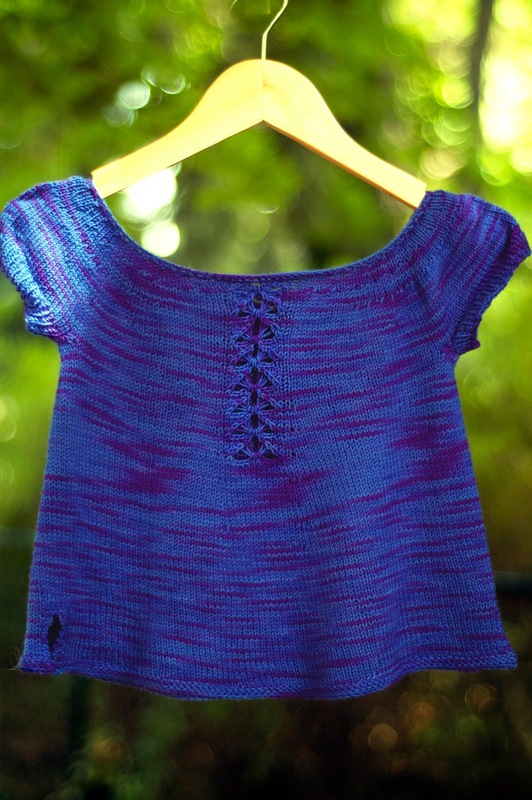 The pattern is Alice Tee by Helen Rose, and the yarn is (of course) Wollmeise Pure in the mindblowing Rittersporn (Delphinium) colorway. 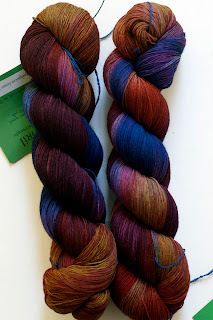 I'd heard people rave about this color but hadn't seen it in person until I got this skein. The camera does not do it justice. It seems to glow with its own purple-y inner light. Cute, isn't it? Except I hated it. I hated it and I was on a deadline: Cecilia's new sibling was due within days, and I needed to get a package posted off to England for them. 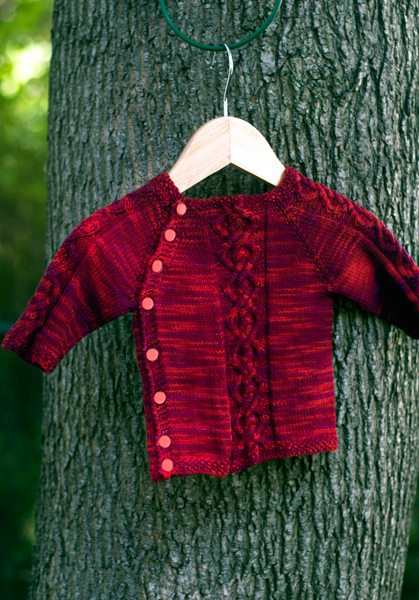 But even after blocking, this piece curled and curled, at the hem and even at the sleeve cuffs. (Look at those tiny sleeves! There isn't enough cuff to curl! 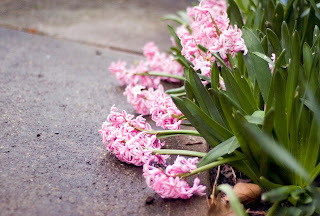 But they were curling.) Curliest damned stockinette stitch I have ever encountered. yep, the sleeves are still curling it's gorgeous! So I tossed it aside for more than a month...and I felt anxious every time I looked at it. Then I covered it up so I couldn't see it, which helped. Finally, on one of the hotter days of this hot summer (did I mention it was hot? ), I broke down and fired up the iron, then started steaming those damned curly edges. It was immensely satisfying to watch them submit. I went over the hem two or three times, then started on the sleeves...and suddenly noticed a distinct lack of steam. No steam, no pleasant whooshing noise, no evocative hot-iron smell, and very little heat. I touched the sole plate and did not get burned (please don't try this at home). The heat of the day must have been too much for it. My iron had expired. But it was enough. C's curly tee was redeemed! I loved it again and I loved the whole world with it (besides, I'd been wanting a new iron). 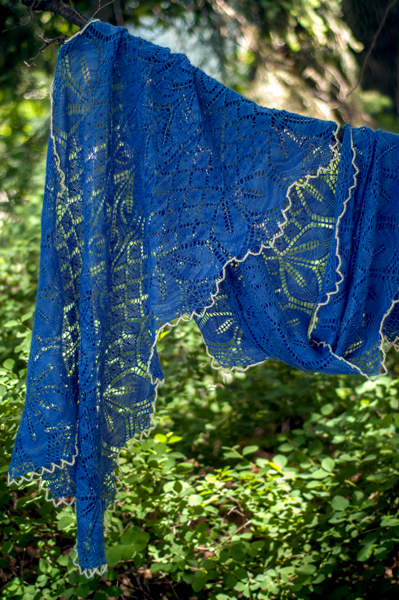 I slapped it on a hanger and ventured out into the glaring sunshine of climate apocalypse to take a few photos. 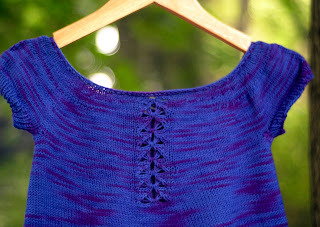 *For Knitters Only: I changed the increases to be more noticeable (more decorative) in the yoke section and less noticeable in the body (going down either side of the lace "placket"). I can't remember the actual increases I used, though, and sadly I did not make notes at the time. My knitting and I are back together and everything is gonna be all right! It was a long hot summer here in Rochester, and without my sweet stitches to hold it all together, I felt every record-setting minute of it. My elbow is still not 100%, so I'm trying to limit the knitting to every other day...but I am knitting and life is good. I feel almost like myself again. 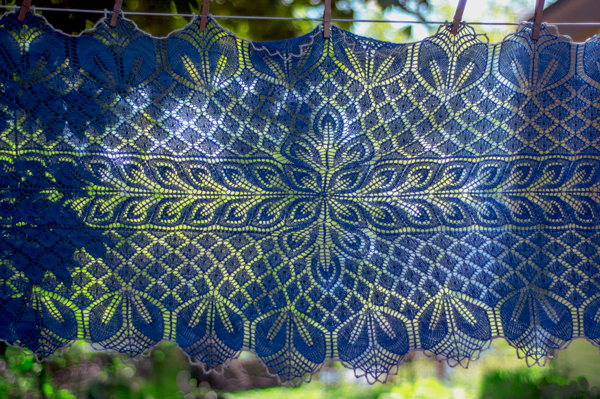 I don't know if it was the not-knitting or the bizarre weather, but this summer flirted with the surreal and I am glad to see it gone. Funny how a couple of sticks and a 100-gram ball of wool can keep you grounded. 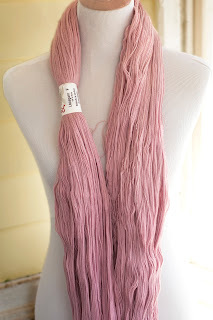 I've been grounded under considerably more than 100 grams of wool with my current project, though, which hasn't been entirely pleasant given the crazy temperatures. (90 degrees in September? In Rochester? Crazy.) 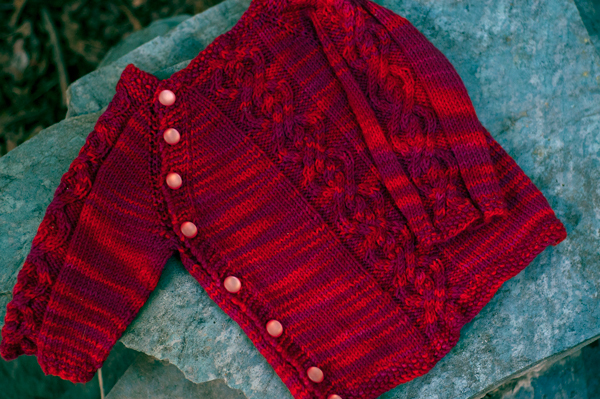 Finally, I'm making some real progress on the Ginormous Cardigan on Teeny Needles. You may remember me enthusing about this piece last June when I brought it out of hibernation. The poor thing had to be set aside for yet another couple of months because of my elbow, but now it's back in hand and taking shape. Since I took this pic, I've finished the back, joined the shoulders, and started the left sleeve. I may actually finish it one day! I have five skeins in this colorway and no two of them match, so I've been changing skeins at random intervals throughout. I like the distressed effect. 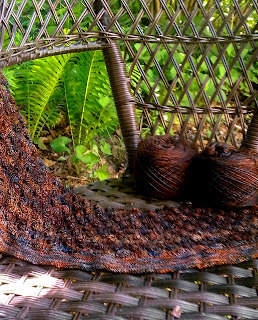 Knitting optimist that I am, I'm already looking forward to wearing it this fall. Think good thoughts for my elbow so I can keep on knitting! Edited to add: Gave myself an earworm with that title. Regretting it. It isn't the fast knitting or the slow knitting that gives me tendinitis; I think it's the lace knitting. Or maybe it isn't knitting at all; maybe it's the computer mouse. Yeah, that's it. It's the mouse! If only it were the mouse. But now that my elbow is all itis-ed, the cause doesn't really matter. Everything aggravates it, including knitting. Not-knitting is an uncomfortable state for a knitter. 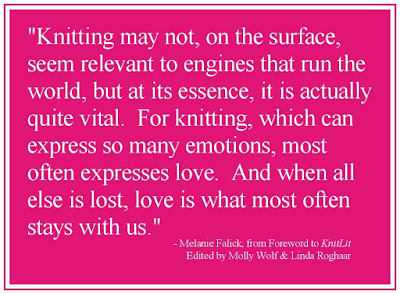 Knitting is my joy and my solace. 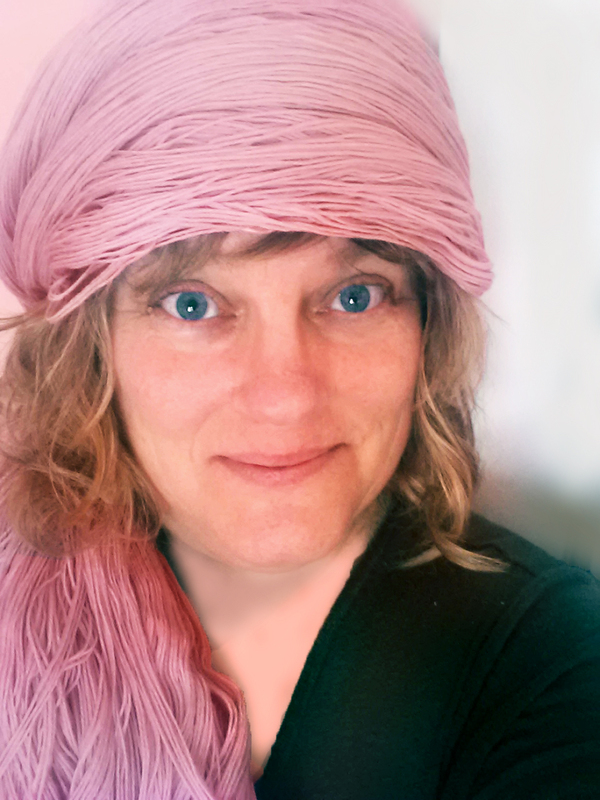 Knitting is my meditation practice. Without knitting, I just don't feel like me. Besides, that Ginormous Sweater on Teeny Needles isn't going to knit itself. And I have all these great project ideas clamoring for needle time. It's keeping me awake at night! or maybe that's the pain in my elbow. 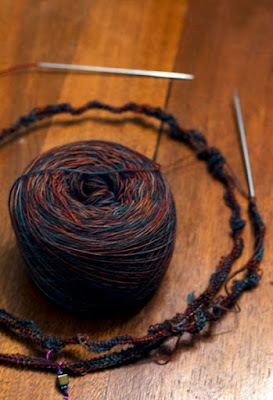 Not-knitting, like grief, comes in stages. I've passed through denial (there's no denying it hurts), and moved directly to bargaining. 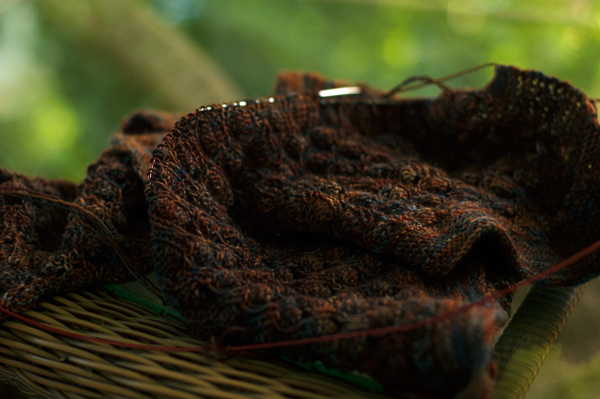 The current bargain goes like this: if I mouse left-handed all day, I can knit for a half hour or so in the evening. Which might be okay, if I didn't lose the ability to tell time whenever I pick up yarn and needles. My conservative bedtime has suddenly become less conservative...and my elbow isn't getting better. So tonight I'm blogging instead of knitting. I think it's working: I'm putting myself to sleep. Hey! my elbow feels better already. I'm sure it'll be fine tomorrow. Some knitting is slow. 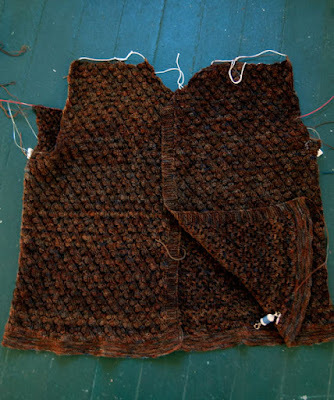 Oversize cardigans for plus-size me in laceweight yarn on teeny needles, just for example, are SLOW. It's going to be amazing. Someday. almost looks like it could be a sweater some day! s l o w l y. 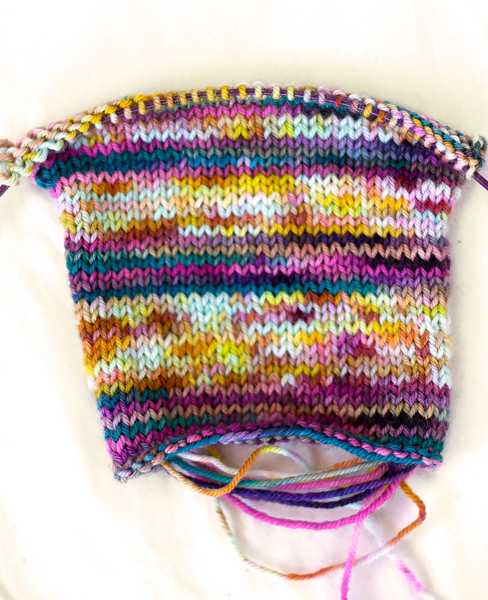 Still, it's lovely relaxing knitting and the play of color across my stitches is deeply satisfying. This is what it looked like at the very beginning, after I cast on 462 stitches.
. . . and I lost the will to live and put it into hibernation for 14 months. But now it's out again and I love it and have forgiven it everything. I may not finish this baby before I'm 70, but right now it's my favorite project! Perfect for knitting outdoors while enjoying the summer air in my lovely leafy garden. The big blue lacy thing with beads (and beads, and beads) is done! I probably shouldn't write about how I hate the white edging (should have made the edging one or two rows wider for the white to work) or how it's so freaking enormous that I'll never wear it (I'm barely 5' 1" and really should have known better), but now that I've typed it out, I'm gonna leave it here. It's a beautiful piece and I thoroughly enjoyed the knitting. Now I need to find it a good home. Yes I know, I disappeared for the entire month of May. And here I was doing so well with this blog! But May is the height of spring migration around here, which means birds, birds, birds. There is nothing I like better than slogging through muddy woods in early spring, looking at birds. I was out there every day, in all sorts of weather, watching springtime creep slowly over the landscape and looking at birds. 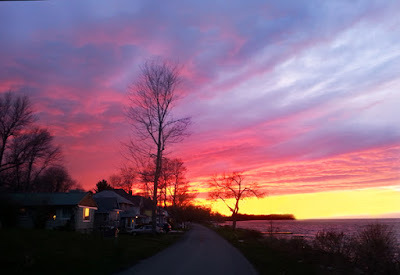 I live along the southern shore of Lake Ontario, which is a great spot to see birds during spring migration. They stop right here to rest and refuel before heading out over the lake, so we get to see a lot of them! We had a slow, cold start to the season and never did get the southerly winds that usually bring the migrants in; just lots of north winds off the lake. They came anyway, out of order and in odd combinations, but they came. I'm a new birder, and I’ve seen 123 species so far this year, including 24 species of warbler, all within a 30-minute drive from my house! I was also fortunate to be out at the hawk watch on a 10,000-bird day. That was pretty spectacular (although they usually have a couple of 30,000-bird days per season, which I find unimaginable). Actually, I don't have to go far at all to see a lot of birds. For a few weeks every May, the trees in my yard are filled with warblers. This year I’ve had black-throated blue, black-throated green, black-and-white, Blackburnian, northern parula, chestnut-sided, bay-breasted, yellow-rumped, palm, pine, Nashville and Tennessee warblers in my trees, feasting on insects and singing their distinctive songs. I had a Blackburnian warbler drinking from my birdbath! Now it's June. Summer is upon us and migration is over. The trees are in full leaf and it's harder to see the birds. But they're still there. You can hear them; if you pay attention, you can see them. Birds are everywhere, busily gathering food to feed their young; busily preparing the next generation for the long flight south. I'm planning to make my list a whole lot longer before the month is out. 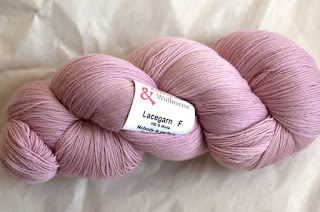 A friend sent me a surprise package with a skein of the most perfect pink yarn EVER. 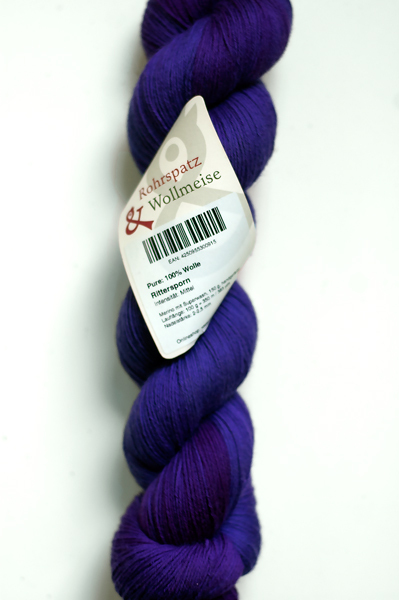 It's the coveted limited-edition Rosenquarz colorway from Wollmeise. I never thought I'd get my hands on it! I started with the enchanted and enchanting belly button cast on. 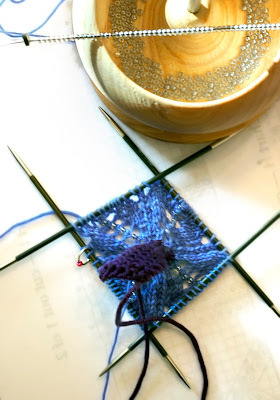 Well, no, I started with the dreaded disappearing loop cast on, but after working it seven or eight times with unsatisfactory results and before heaving yarn, needles, pattern, and laptop out the window, I decided to stop tormenting myself and switched to the belly button. It worked on the first try. I think I've learned my lesson. I'll do the belly button first from now on. 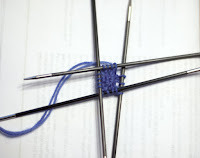 Five needles > two hands, and when you factor in fine yarn, tiny stitches, and skinny little needles that slide out of the tiny stitches, the end result = language I wouldn't share with my mother. The belly button solves all this. 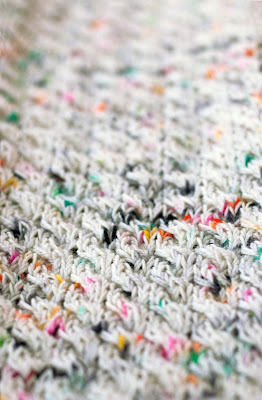 You use a nice heavy yarn, get it started on just two needles, then work in the round for a few rows 'til you have a nice firm tube as a foundation. 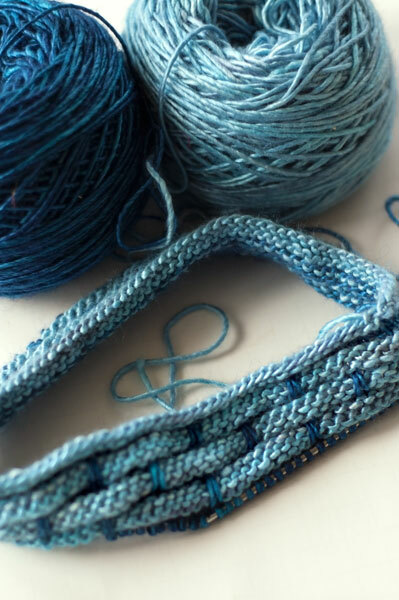 Then change to your project yarn, leaving the end hanging, and just keep going. You remove the belly button later and tighten up the central stitches with that dangling free end. Voilà! A perfect in-the-round cast on. I love the belly button. Progress seemed fast at first. I zoomed around that central star, placing my oh-so-carefully chosen beads as I went. 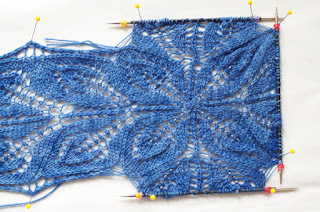 Then I put stitches on hold on three sides of the central star while I worked double leaf motifs back and forth going out to the side, until I had a total of fifteen (including the central ones). For the sake of symmetry, I repeated the process on the opposite side. 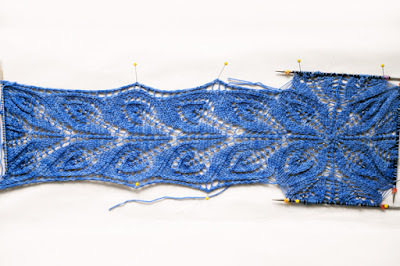 At about the fourth repeat on the second side, I realized it would have looked just as symmetrical with three or four fewer repeats, but there was no turning back. 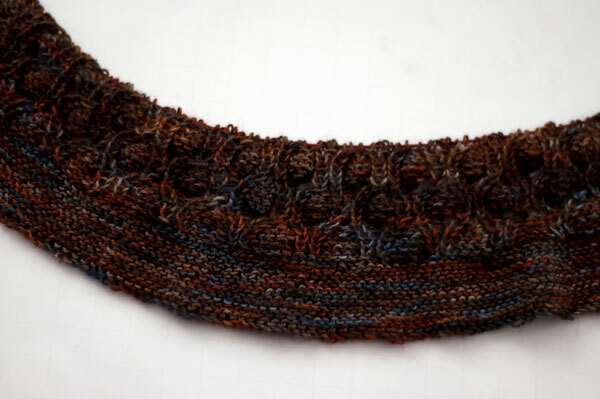 Besides, fewer repeats would make a shorter stole, and I want to be able to wrap it around my ampleness a couple of times. But now it's a few days later. I've finished all the pesky leaf motifs and moved on with my life. I picked up nearly 500 stitches (yes, that's a five followed by two zeros) along the long, long, 15-motifs-long side pieces, scooped up the live stitches waiting on the sides of the central star, and now I'm knitting this whole long skinny rectangle in the round! 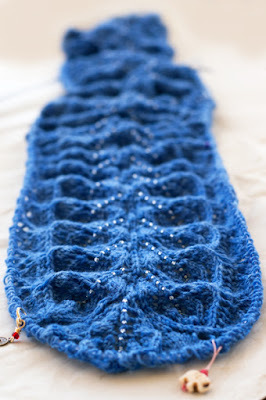 Of course, a long skinny rectangle is a far cry from a circle, so this presents its own set of challenges (no bad language was required), but now that I'm 10 rows in, it's getting easier...and I have a beautiful blue baguette to show you. Yeah, I know, it doesn't look like much. 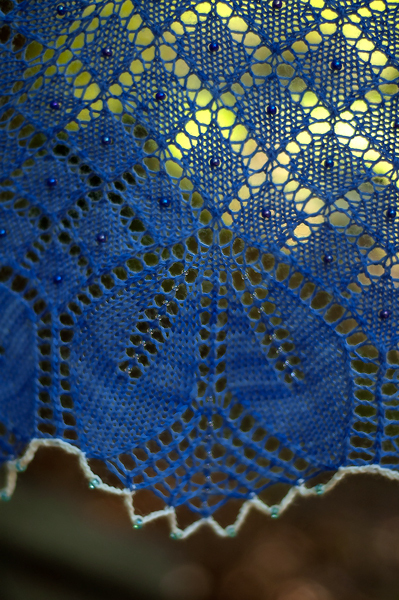 The thing with lace is that it requires blocking to be at its best. 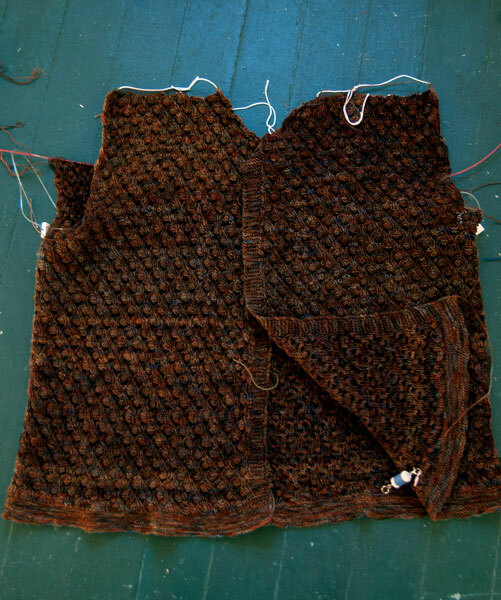 Blocking is done to almost all knitting after it's finished. It involves soaking the item in water, then stretching it gently to the desired shape and size. 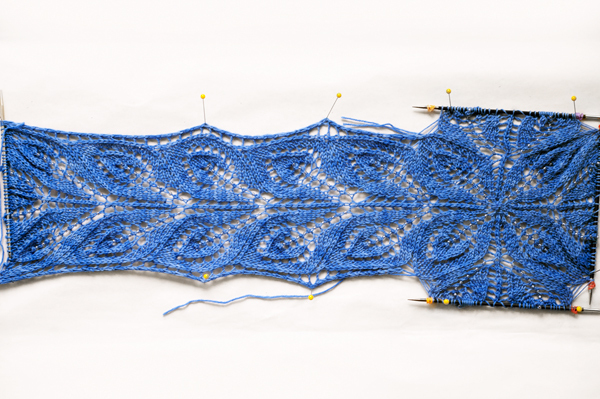 With lace knitting, the stretching is not gentle. You pull on it in every direction until it can't possibly be pulled any more, then pin it down and let it dry. It's a near-miraculous transformation. 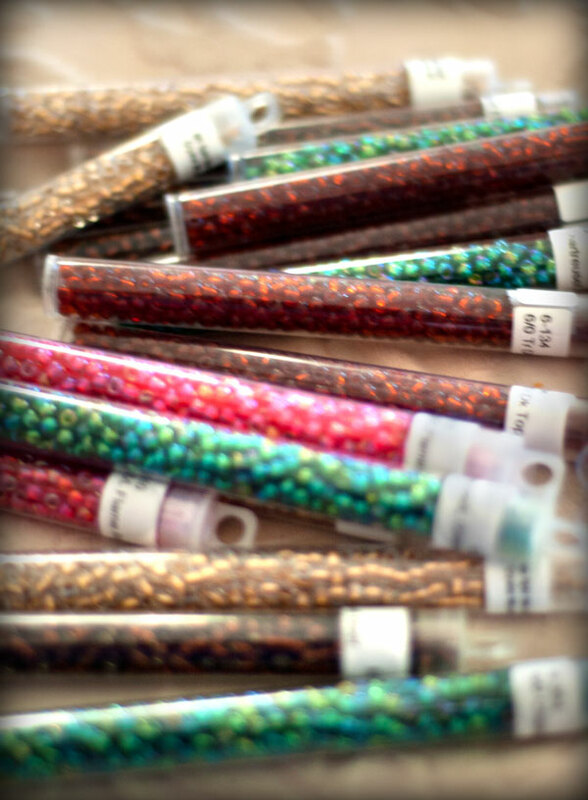 But for now, we're going to be deliriously happy with the beaded blue baguette. I decided to make another Big Lacy Thing with Beads. I dunno why; I am not a lacy kind of girl. But I love knitting big lacy things with beads. 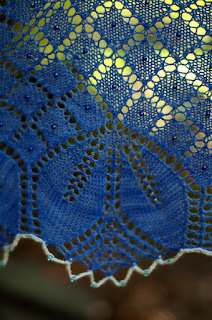 And they're having a Round & Holey KAL on one of my Ravelry groups. 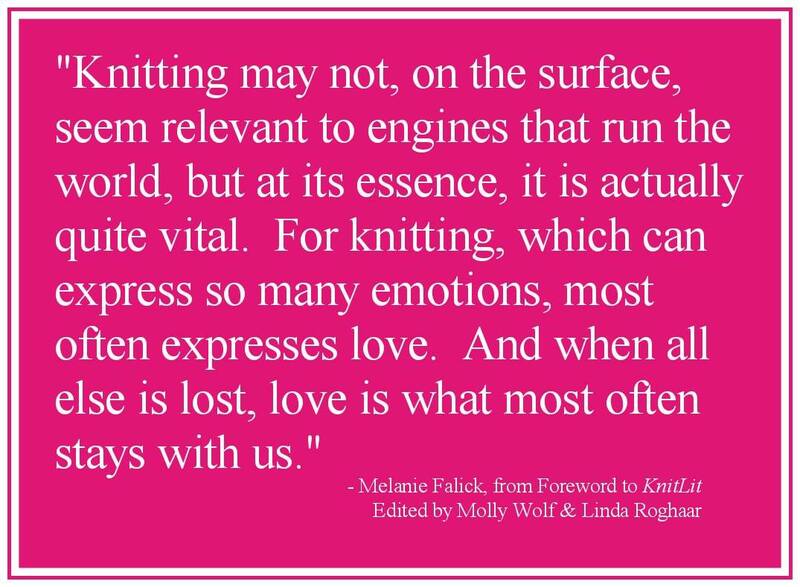 KAL = Knit-A-Long (and yes, I do need to get to work on that glossary of Knitting Terms for the Uninitiated). Round means it's knitted in the round (although it doesn't have to end up round--it might be square, or a rectangle, or any other shape on the spectrum between circle and not-a-circle). Holey means it has holes in it; in other words, lace. 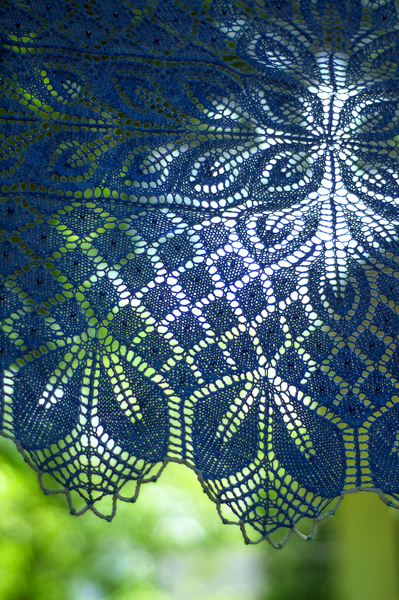 I do love to knit lace. Too bad I hate wearing it. Oh well. 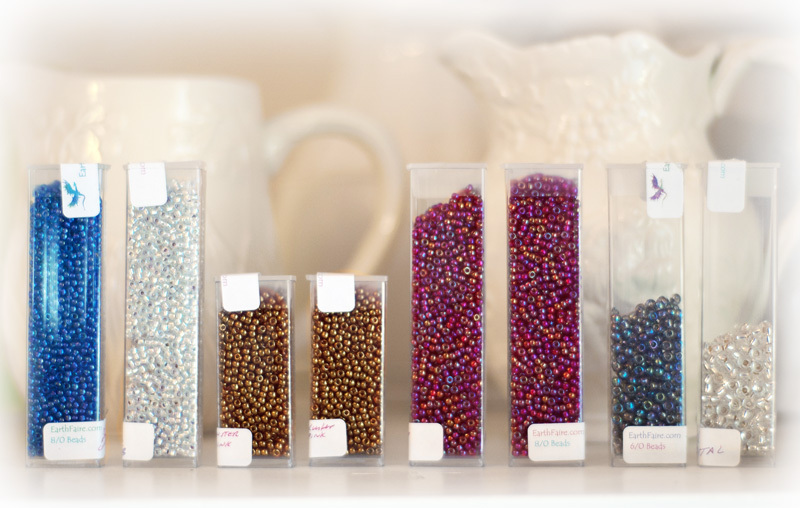 Big lacy things with beads make awfully pretty gifts. I chose the yarn easily enough. I've had it for a while, waiting for the perfect project. It's blue. Specifically, Himmelblau. Possibly the prettiest blue on the planet. Certainly the perfect blue for early spring when we are starved for true-blue skies. The pattern is Amillë, by Emily Ross. 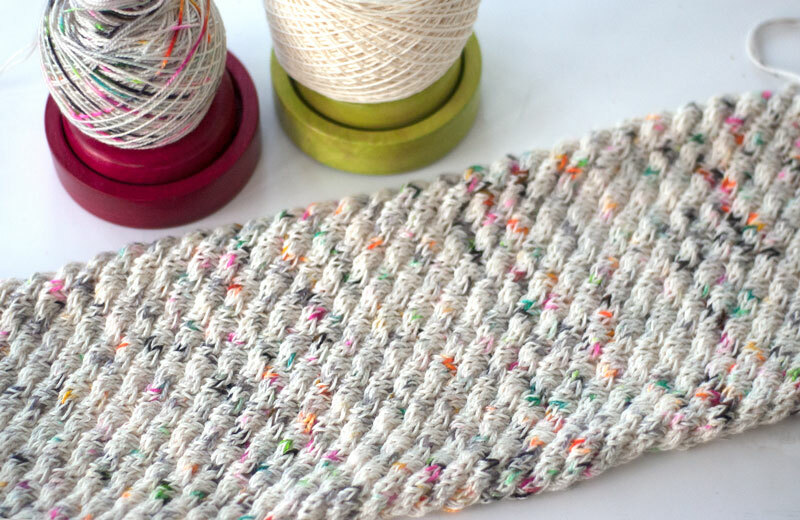 It's a looooong rectangle, knitted mostly in the round. I may actually wear this one--it looks nicely scarf-shaped. Wrapping it around a couple times tends to neutralize the laciness. I couldn't just go through my bead drawer, because my bead drawer had been overwhelmed by buttons (somewhere along the line I thought it was a good idea to start a button stash, too). 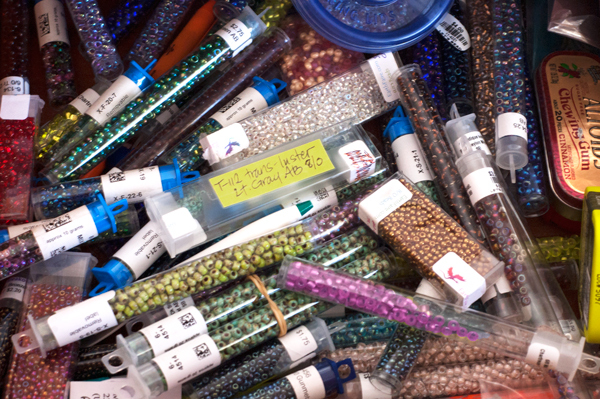 So before I could get on with the beads, I had to pick all 7965963 buttons out of the bead drawer, sort them by size and color, put them in ziploc bags, and find them their own little storage bin. I particularly liked the fish buttons. I left one out so I could enjoy its little fishy face. 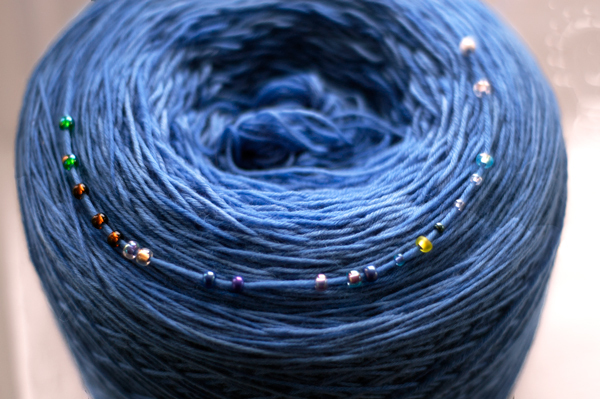 And then, at long last, I started stringing beads on my yarn to see how I liked them. Funny thing happened...I liked all of them. 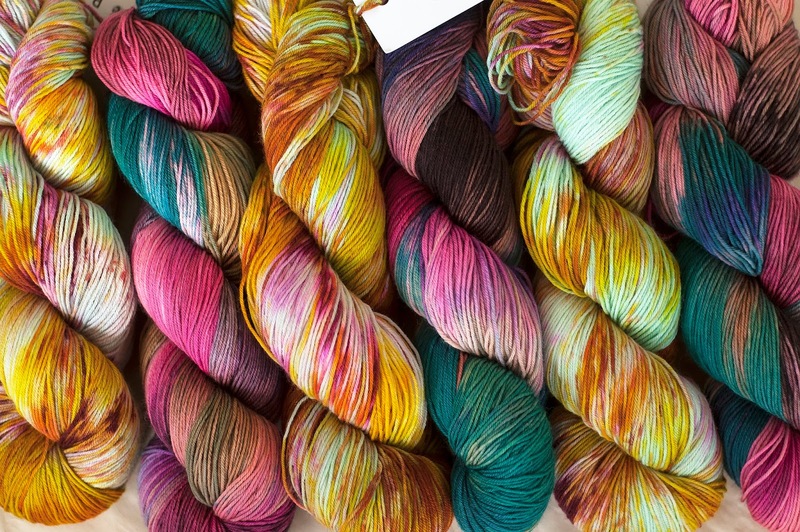 I strung increasingly unlikely colors...and I liked them too! Clearly, this was developing into a situation. Indecision does not suit me. I decided to wait until daylight. Watch this space for updates on the Big Blue Lacy Thing With Beads. 1. Pompoms use a LOT of yarn. 2. Pompoms do not grow back, so one must take care with the scissors when trimming them to shape. Corollary: Sometimes a flat spot is best ignored. 3. 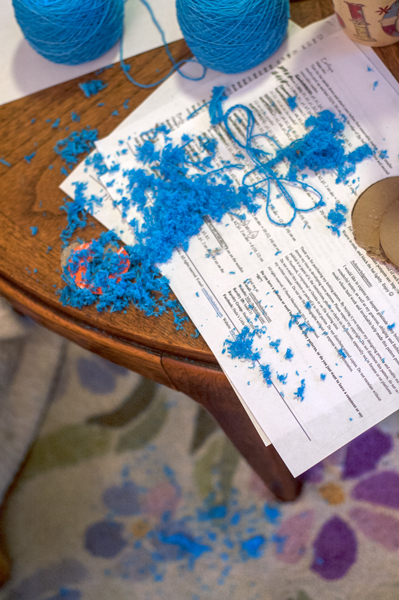 Pompoms can make a heckuva mess. 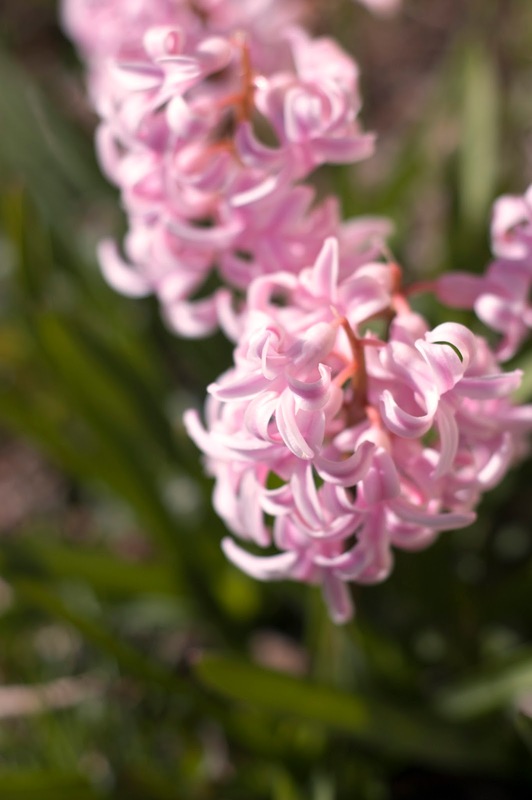 Trim them in an easily swept-up spot. 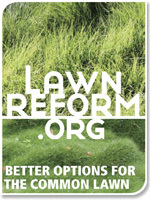 Corollary: Do not not trim over your computer keyboard, your contrasting-color wool sweater, or your lunch. Note: The pompoms, while delightfully plump and plush, are now measurably smaller than they were in the photo above. 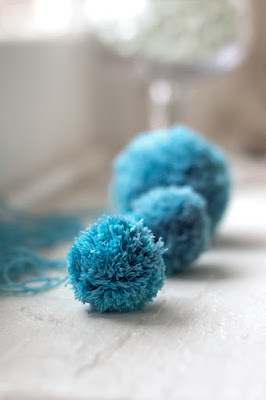 I really can't wait to make pompoms again!